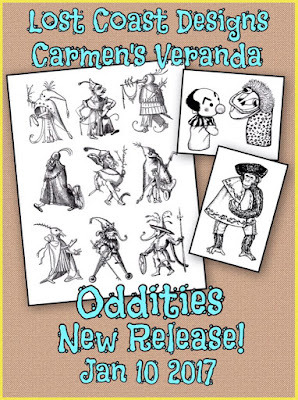 Velvet Paw Creations: "AUDities" tag book - Lost Coast Designs New Stamps Release! 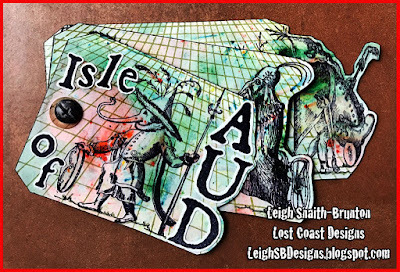 "AUDities" tag book - Lost Coast Designs New Stamps Release! We're kicking off our 2017 events over at Lost Coast Portal to Creativity's event and challenge blog with a New Stamps Release! 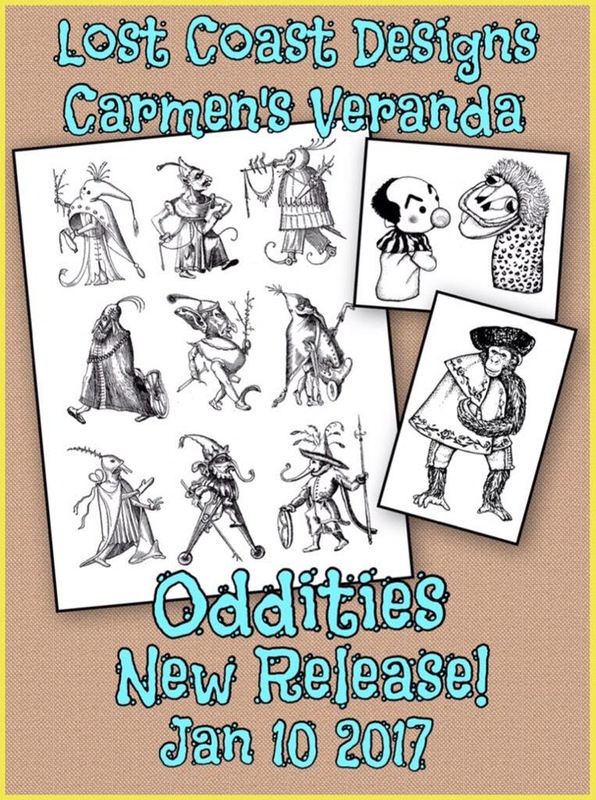 a set of 9 AUD Creatures joins our Lost Coast Designs Isle of Aud line and a Matador Monkey and two puppets called Kukla and Ollie join Carmen's Veranda! Pop on over to LCPtoC to see these newbies in action! 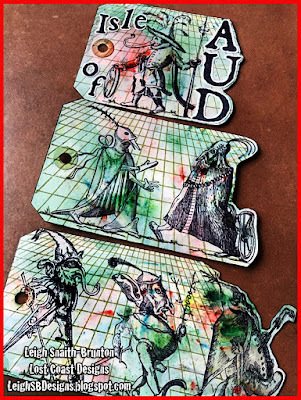 Using 5 of the 9 new AUD Creatures I made an "AUDities" tag book! The tags are held together in book form with a nut and bolt and I plan to add more tag pages throughout the year! I started off with 3 large white shipping tags I got from A Stamp In The Hand and applied colour using Nuance powders and a Tim Holtz water spritzer. The AUD Creatures were all stamped with black Archival ink and then masked with Pebeo masking fluid. I then stamped the Large Perspective Grid stamp in Peeled Paint Distress ink onto each tag. The large grid stamp was a bit smaller than the largest tag so I drew in the grid lines with a Peeled Paint Distress Marker. 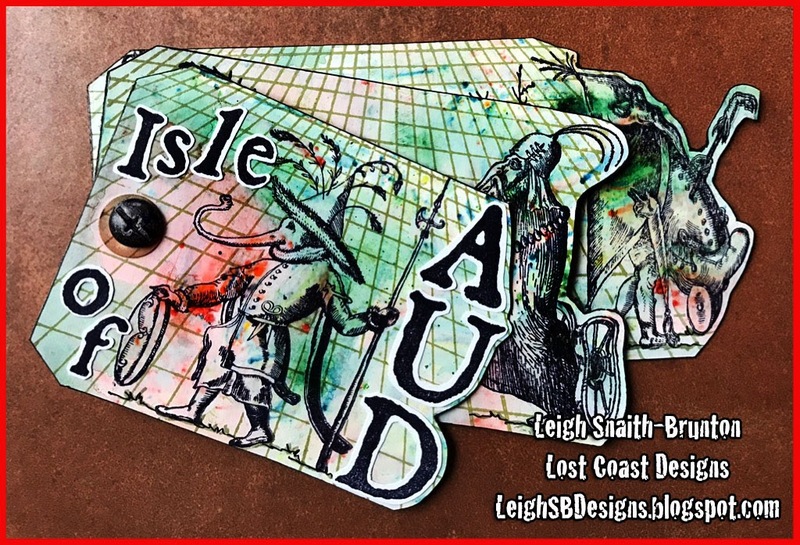 I stamped the text "Isle of AUD" using Old Typewriter Capitals only and the Old Typewriter Alphabet that consists of smaller upper and lowercase letters (plus numbers). I fussy cut out the letters and adhered them to the cover tag with a glue stick. I then cut the right hand edge of all 3 tags so create the staggered effect once the tag book is closed. To make the colours on the AUD Creatures stand out more from the background I applied a thin coat of Triple Thick gloss to them with a paint brush after removing the masking fluid of course! You can't really tell in the photos but the gloss coat deepens the colours and makes them richer and pop out more from the background. I then edged each tag with a black marker and assembled the tag book. This was so much fun to make!